WHAT: A digital social loyalty card that consumers can use to earn cash-like points for their purchases. Facebook and Twitter integration lets users recommend friends to stores. Whenever friends buy at the store you recommended, Spoqa sends a mobile push notification informing you that your friend saved you X number of points at the store. Receive 100 points for downloading the app. Currently only available in South Korea but will eventually launch in the U.S.
LAUNCHERS: Richard Choi, CEO, Jaeseok Kim and Victor Ching. WHY: Most customer loyalty programs are anti-social. Groupon-style offers do not guarantee repeat business. Friend suggestions and recommendations are more effective for small businesses than ads or coupons. WHEN/WHERE: Sept. 8, 2011 / South Korea. BACKSTORY: Richard was part of Korea's first Groupon clone, Wipon, in August 2010. As he watched the industry explode, he questioned the sustainability and scalability of Groupon-style businesses. "There were several cases of store owners complaining about huge losses they incurred, as repeat business that they were promised was not generated from coupon users," Richard tells LAUNCH via email. "I realized that the problem is not about sending new customers to new vendors. It's about incentivizing customers to keep returning to vendors that they liked. Also, there was nothing 'social' about the Groupon-style social commerce business model." BUSINESS MODEL: App is free for customers. Spoqa charges vendors a "small" fee [ not disclosed ] for using the service, less than what Groupon-type companies charge for their services. ON COMPETITION: "There were attempts to consolidate loyalty cards by bringing them to a mobile platform," Richard says. "But they usually didn't take off because either they weren't fun to use or people didn't find the services useful enough. There also isn't a mobile loyalty program that involves the user's friends as much as we do. One person's purchase really changes another person's purchase decisions. It's really dynamic and companies such as Punchd or other location-based companies don't have similar services." CUSTOMERS/GROWTH: 60 venues in "trendy & high-traffic areas of Seoul," 20 of which are live. In talks with three chain restaurant/beverage companies. Richard plans on signing on 1K stores by the end of 2011. GOAL: "Our mission is building a platform that enables you to change your friends buying decisions, and vice versa such that buying isn't a lone activity anymore," says Richard. ON THE BRAND LOYALTY MARKET: "It's about setting an image that people can empathize with, which results in customers choosing one brand over another, even if the conditions of the brand's products or services might be equal or worse than its competitors," Richard texplains. WHO BACKED IT: Janghwan Chung, director at LSVenture. Click the "location" button to see a list of nearby places to earn or use points. Select a store from the menu and click "Earn points" to earn points. 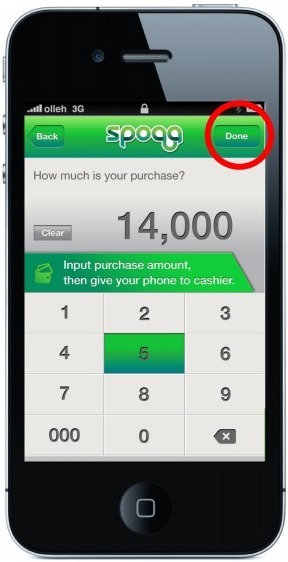 The cashier enters the amount of the purchase on your phone. 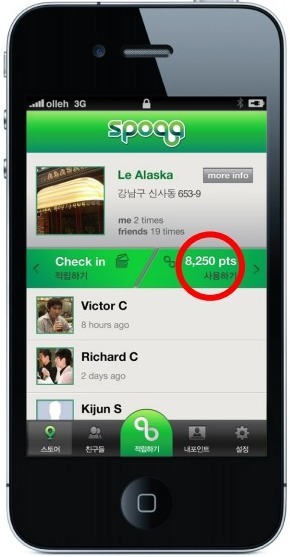 Spoqa tells users how many points they saved and prompts them to recommend the store to a friend. To see a listing of stores nearby, click the location icon on the far left. From a store's profile page, click "Use points."